In other words, it’s at least possible that this crisis the Republicans created could have a beneficial effect. It’s also possible that this crisis the Republicans created could cripple the full faith and credit of the U.S. government, plunge the economy back into recession, and increase borrowing costs for just about everyone. But whatever happens, Republicans created this crisis. They blew up the debt. They refused to raise the debt ceiling without conditions. And because of their internal divisions, they can’t even decide what those conditions should be. They initially demanded a breakdown of 85% spending cuts and 15% revenue increases, before deciding the deal had to be 100% spending cuts. Some initially praised the bipartisan Gang of Six plan—until Obama endorsed it. Now Senate Majority Leader Harry Reid has a proposal for 100% spending cuts, all of which Republicans hadalready endorsed –until, of course, Reid proposed them. There are two basic truths about the enormous deficits that the federal government will run in the coming years. The first is that President Obama’s agenda, ambitious as it may be, is responsible for only a sliver of the deficits, despite what many of his Republican critics are saying. The second is that Mr. Obama does not have a realistic plan for eliminating the deficit, despite what his advisers have suggested. The New York Times analyzed Congressional Budget Office reports going back almost a decade, with the aim of understanding how the federal government came to be far deeper in debt than it has been since the years just after World War II. This debt will constrain the country’s choices for years and could end up doing serious economic damage if foreign lenders become unwilling to finance it. Mr. Obama — responding to recent signs of skittishness among those lenders — met with 40 members of Congress at the White House on Tuesday and called for the re-enactment of pay-as-you-go rules, requiring Congress to pay for any new programs it passes. If the analysis is extended further into the future, well beyond 2012, the Obama agenda accounts for only a slightly higher share of the projected deficits. How can that be? Some of his proposals, like a plan to put a price on carbon emissions, don’t cost the government any money. Others would be partly offset by proposed tax increases on the affluent and spending cuts. Congressional and White House aides agree that no large new programs, like an expansion of health insurance, are likely to pass unless they are paid for. When challenged about the deficit, Mr. Obama and his advisers generally start talking about health care. “There is no way you can put the nation on a sound fiscal course without wringing inefficiencies out of health care,” Peter Orszag, the White House budget director, told me. Outside economists agree. The Medicare budget really is the linchpin of deficit reduction. But there are two problems with leaving the discussion there. First, even if a health overhaul does pass, it may not include the tough measures needed to bring down spending. Ultimately, the only way to do so is to take money from doctors, drug makers and insurers, and it isn’t clear whether Mr. Obama and Congress have the stomach for that fight. So far, they have focused on ideas like preventive care that would do little to cut costs. Second, even serious health care reform won’t be enough. Obama advisers acknowledge as much. They say that changes to the system would probably have a big effect on health spending starting in five or 10 years. The national debt, however, will grow dangerously large much sooner. Mr. Orszag says the president is committed to a deficit equal to no more than 3 percent of gross domestic product within five to 10 years. The Congressional Budget Office projects a deficit of at least 4 percent for most of the next decade. Even that may turn out to be optimistic, since the government usually ends up spending more than it says it will. So Mr. Obama isn’t on course to meet his target. But Congressional Republicans aren’t, either. Judd Gregg recently held up a chart on the Senate floor showing that Mr. Obama would increase the deficit — but failed to mention that much of the increase stemmed from extending Bush policies. In fact, unlike Mr. Obama, Republicans favor extending all the Bush tax cuts, which will send the deficit higher. Republican leaders in the House, meanwhile, announced a plan last week to cut spending by $75 billion a year. But they made specific suggestions adding up to meager $5 billion. The remaining $70 billion was left vague. “The G.O.P. is not serious about cutting down spending,” the conservative Cato Institute concluded. “Things will get worse gradually,” Mr. Auerbach predicts, “unless they get worse quickly.” Either a solution will be put off, or foreign lenders, spooked by the rising debt, will send interest rates higher and create a crisis. The solution, though, is no mystery. It will involve some combination of tax increases and spending cuts. And it won’t be limited to pay-as-you-go rules, tax increases on somebody else, or a crackdown on waste, fraud and abuse. Your taxes will probably go up, and some government programs you favor will become less generous. That is the legacy of our trillion-dollar deficits. Erasing them will be one of the great political issues of the coming decade. More Articles in Business » A version of this article appeared in print on June 10, 2009, on page A1 of the New York edition. 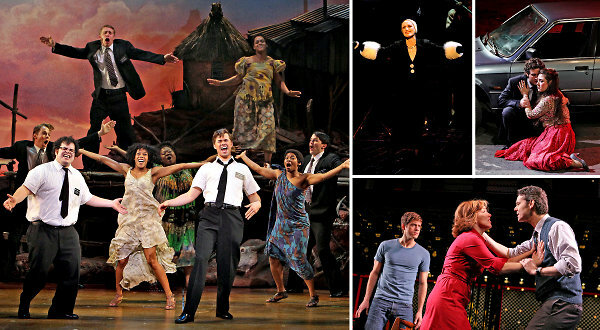 Clockwise from left, “The Book of Mormon”; Glenn Close as Norma Desmond in ”Sunset Boulevard”; Oksana Dyka and Mario Cassi rehearsing “Pagliacci” at La Scala; and, from left, Aaron Tveit, Alice Ripley and J. Robert Spencer in "Next To Normal." MORE than ever, composers are busily breaking down walls between stylistic categories. Opera in particular has been a poacher’s paradise. We have had folk opera, jazz opera and rock opera. Bono, who collaborated with the Edge on the music and lyrics of “Spider-Man: Turn Off the Dark,” called the show “Pop-Art opera.” Whatever that means. But of all such efforts, mixing opera with the Broadway musical might seem by far the most natural combination. Then why are so many efforts to crisscross that divide so bad? For one thing, composers from outside the field often have a distorted understanding of what opera actually is. They borrow the most superficially grand, inflated and melodramatic elements of the art form, whereas opera is actually a richly varied and often tautly narrative genre of musical drama.